Call of Duty: Black Ops is rubbing one nation the wrong way. Cuba's state-run media has blasted Activision's latest entry in the Call of Duty series as "doubly perverse" propaganda for a story arc involving former president Fidel Castro. 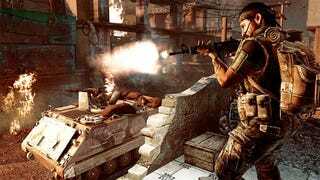 According to a report from the AP, state-run news web site Cubadebate is slamming Black Ops, not for its lag on the PC version or lack of campaign co-op play, but for a mission set in Havana that targets a young Castro. Cubadebate doesn't seem too sensitive of spoilers, so if you haven't played the game's single-player campaign, watch out! "What the United States couldn't accomplish in more than 50 years, they are now trying to do virtually," the outlet writes about an in-game assassination attempt on lil' Fidel. Cubadebate labels Black Ops "doubly perverse" because "it glorifies the illegal assassination attempts the United States government planned against the Cuban leader" and "stimulates sociopathic attitudes in North American children and adolescents." Geez, Cuban media. The game's not that bad. We really liked it! Read on, but only if you already know the circumstances involving the in-game attempt on Castro's life and the aftermath of that section of the game. And if you're traveling to Cuba any time soon, best leave your Black Ops at home, lest customs yoink it and trade it in for credit at GameStop.